Bisley-with-Lypiatt: Bisley or Seven Springs; “They are the source of a tributary of the Toadsmoor Brook, which rises in a spring…in Blanche’s Bank below Stancombe Farm.” There are also springs in Lypiatt Park, Middle Lypiatt, Lower Lypiatt…and below Bussage Churchyard. Nashend, Eastcombe, Bournes Green (“which is the source of a brook that joins the Frome below Baker’s Pool”), Oakridge, Oakridge Lynch (“likewise the source of a small stream”), Tunley, Daneway, Waterlane, Battlescombe, Througham, Slad Farm, Calfway Farm, Stancombe Farm, Fennell’s Farm, Ferris Court…are all situate…where water is obtainable from shallow wells or springs…Hill House and Snakeshole which give rise to a stream that flows down the Horns Valley that is joined by a streamlet rising below the Heavens.” The Slad Brook comes down the Dillay Farm valley and flows below Snow’s Farm and Steanbridge Farm, and southwards through the pond at Steanbridge. Below Snow’s Farm the Slad Brook is joined by a brook coming down the “Piedmont Valley”. The brooks derive their supplies from springs issuing from the base of the Cotteswold Sands.” These brooks flowed with an average of about 300,000 gallons a day according to a fine summer’s day gauging in 1927. With messages from another aeon. God and Darwin side by side. With dreams of another way to be. Seeking out the philosopher’s stone. But how can we confine the mercurial? Knotgrass, creeping buttercup, chickweed, mare’s tail. When the rains fell from unrecorded skies. About how springs affect us? In misunderstood ways, even today. Still cause subsidence even today. Dark green clumps of dark green grass. 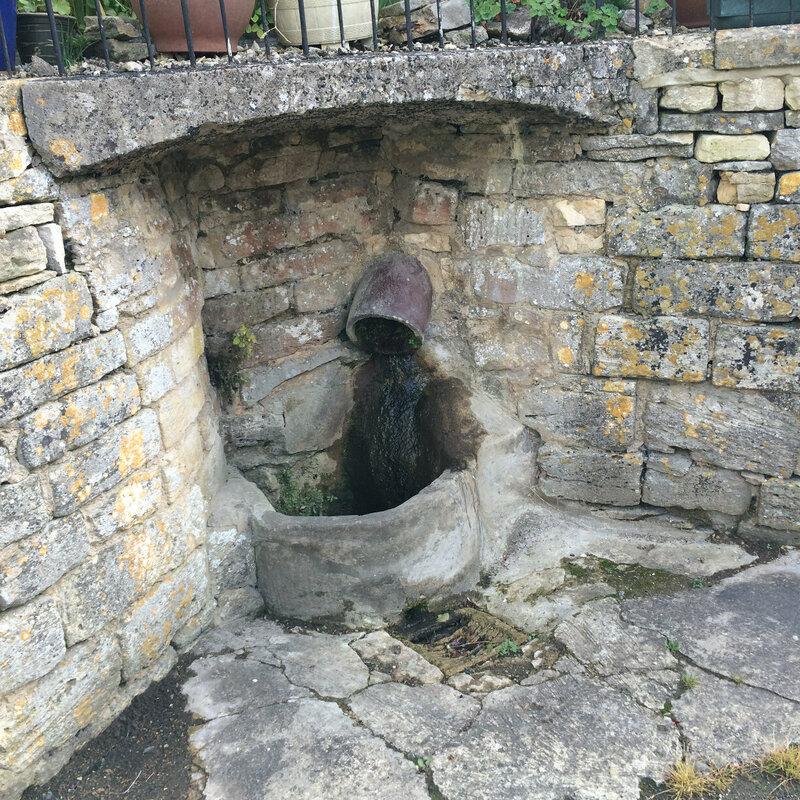 I was born and raised in Butterow near Stroud and well remember the spring at the bottom of the hill towards Bagpath, when we were children we used to play in the spring and drink the crystal clear water which gushed from a large pipe into a large basin. The water was always stone cold even in the height of summer, the overflow from the spring ran under the road and down a steep slope in which my father had water cress beds, also some of the villagers grew pumpkins and marrows by the side of the beds, my father played football for the THRUPP TEAM and my mother told me that my dad would stand in the spring on his way home to take the bruises out of his legs. I well remember old Mr. Turner going by our house with a yoke over his shoulders with two large churns each side to collect his daily supply of water from the spring. 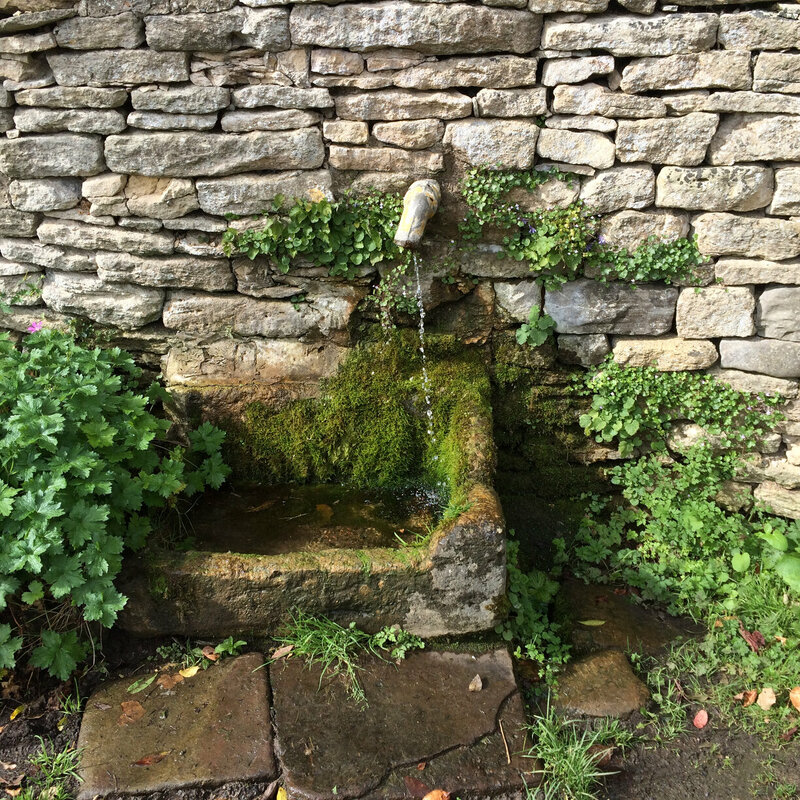 Most of the houses in Butterow had wells including our house which had a pump in the back kitchen so the wells must have been supplied by springs. 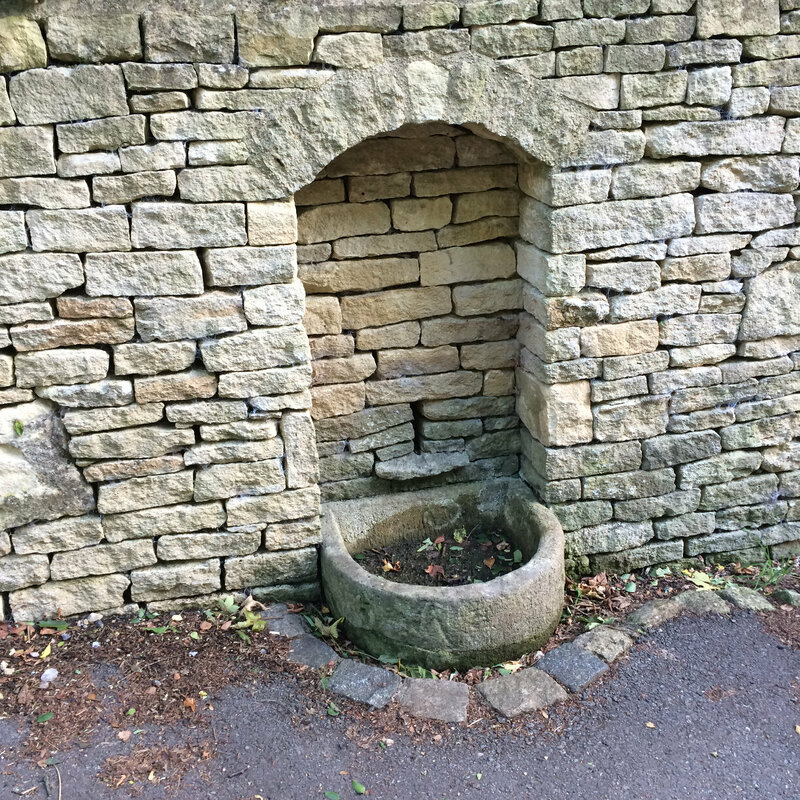 When mains water was supplied to BUTTEROW a sign was put on the spring saying that it was unfit for drinking. We never took any notice of that and continued to drink and play in the spring for as long as I can remember. 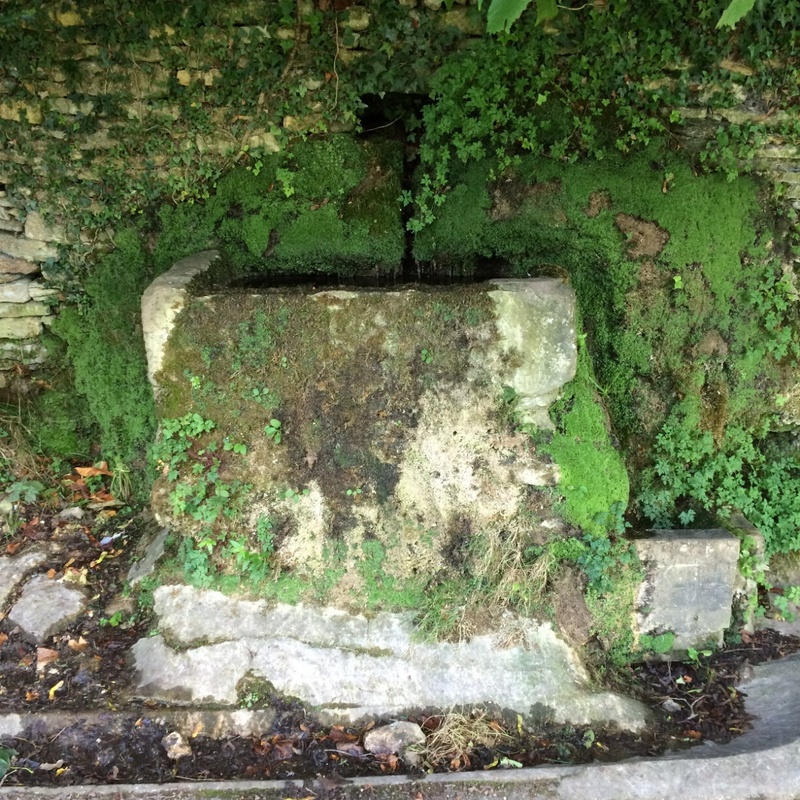 I also drank from the spring in FIELD ROAD on the way up to Stroud Hospital and also there was a spring in KITESNEST LANE LIGHTPILL opposite ORCHARD VIEW ROAD where someone grew pumpkins and marrows by the side of the spring. The field on which our houses are built in FISHERS WAY and CHANDOS ROAD as covered in springs which sometimes reappear and run across the roads. 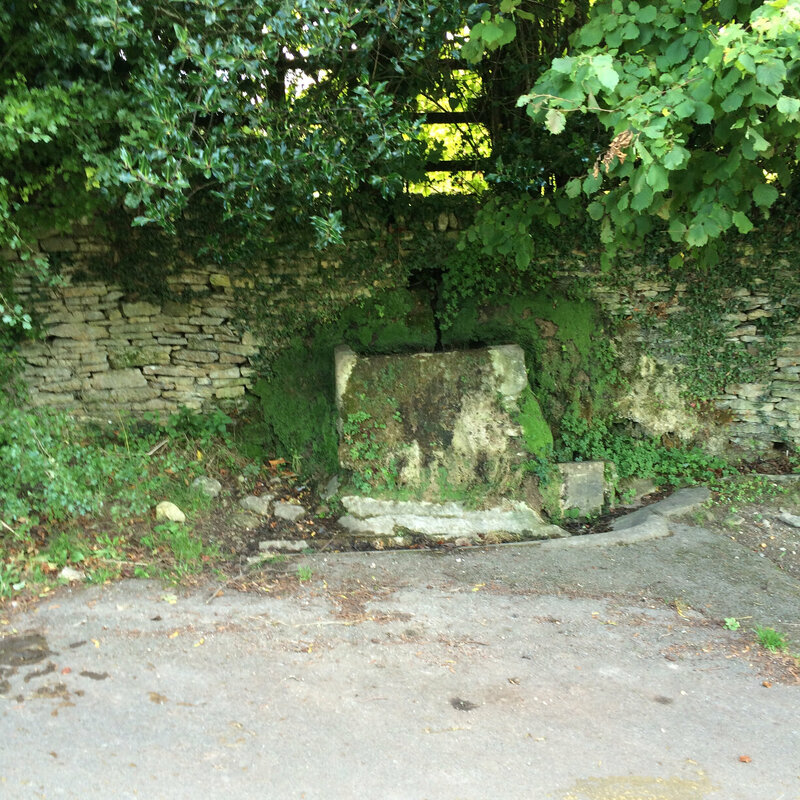 Also in the valley in GASTRELS LANE there is a spring still running at the side of the road. I hope this letter has helped you in your research on springs in the district as it brings back happy memories of my childhood. I think there are quite a lot near us, in and near The Street ( we are hoping we are not on the spring line to the extent there’s one under our house!). There’s an ‘official’ one in the Street, not far from Zara’s house. We could show it to you. It’s for the public to use (though not everyone agrees). 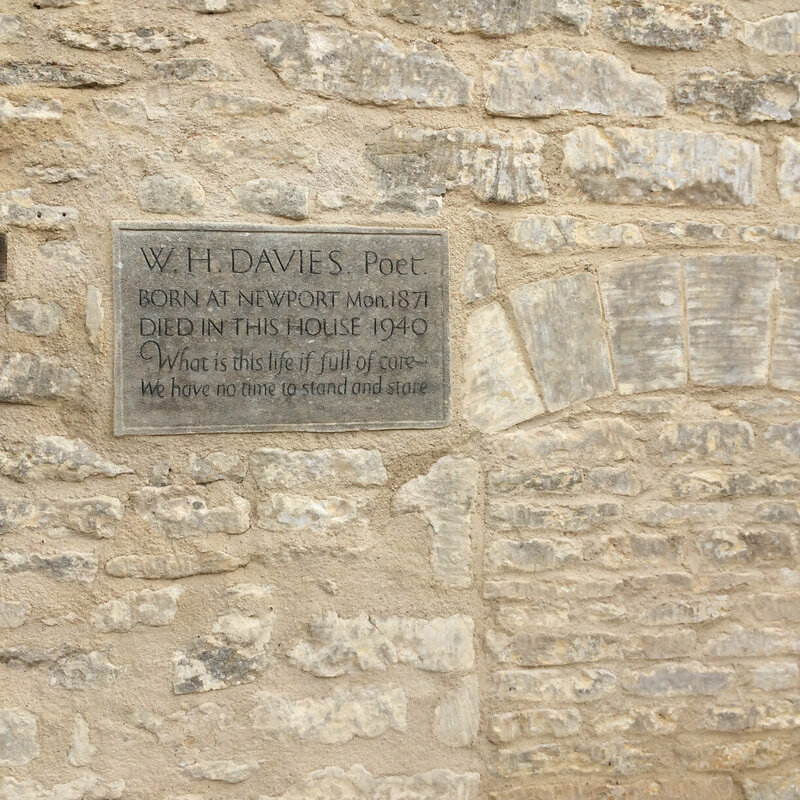 When a lovely old lady next door to us died in 1995 we put up a little plaque there in her honour. She was called Elsie Close (née Harris or Vick, I forget now). She was born in 1903 and lived in Kingscourt most of her life. Her granny had been the village midwife! (unofficially, of course, in those days). In order to ingratiate himself with Elsie’s parents when he was courting her, Jack, her sweetheart, would go to fetch water from the spring on Sunday evenings ready for Monday washing. They eventually married and had two daughters, both of whom have died. Jack died in 1979. I have a marvellous photo of him and Elsie taken by the SNJ photographer on the occasion of their Golden Wedding. Bob Tiley and Oak Drive – they had intended to build individual houses there but it proved to be too expensive as the buildings needed such strong and deep foundations because of the springs there; so they built flats instead of houses. What seems to be a sociological or economic decision has in fact been determined by subterranean springs. 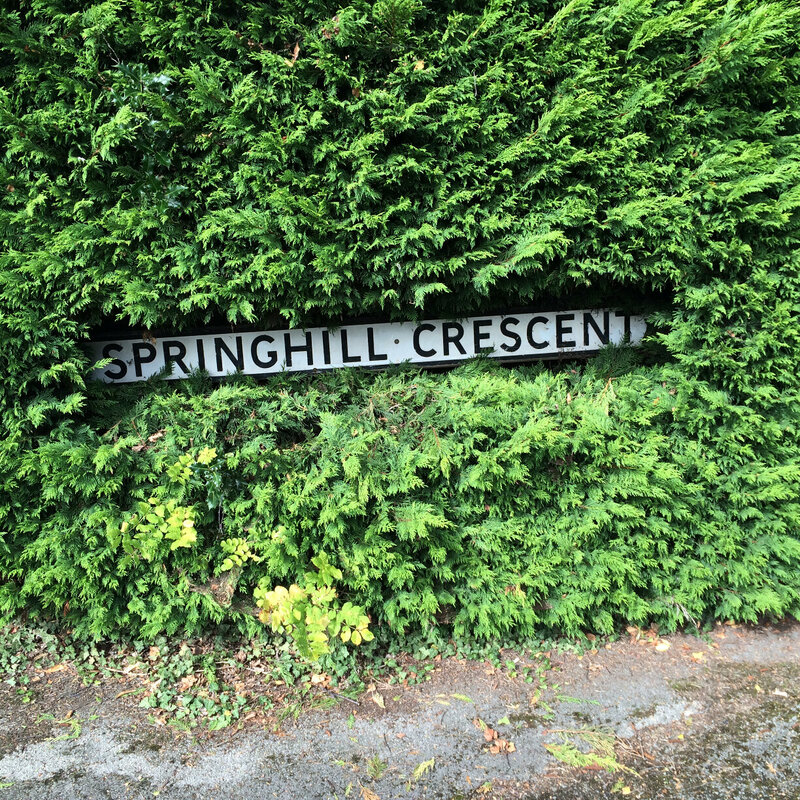 Tony says the spring behind his house runs down to the last house in Rodborough Avenue; springs have been culverted around this part of Rodborough but he is sure they run continuously. 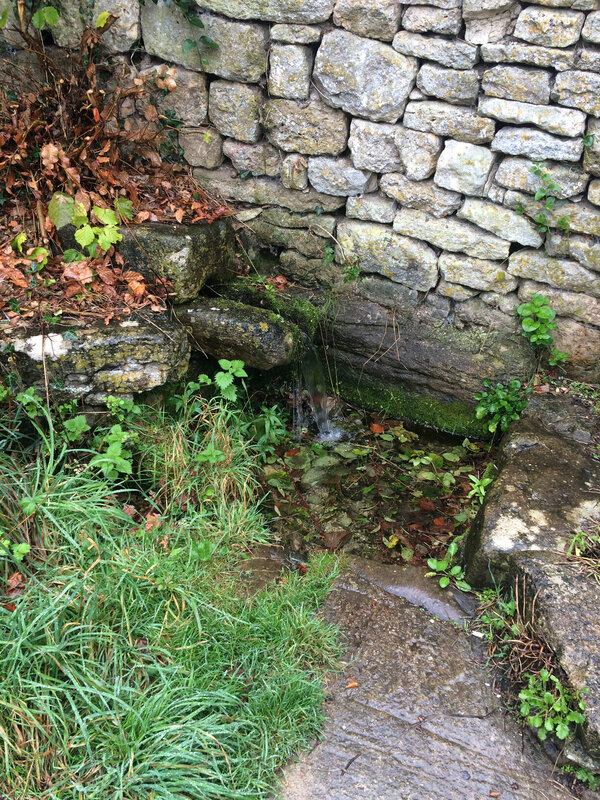 Giles Diggle has just had a spring appear in his garden in Chandos Road after one nearby was culverted; the impact of the wet summer, 2012.
sorry – forgot to mention the springs! You will almost certainly be aware of the springs along the Slad valley below Summer street. When we lived at Lower Woodlands in the Slad Road we could see the darker green grass clumps opposite our house very clearly in the summertime. We also discovered the hard way the seam of Fuller’s earth that runs around the Slad valley about two-thirds of the way up, behind Swift’s Hill – it made some footpaths extremely treacherous. Are you including wells? There were a few on The Field estate in back yards, and I have an as-yet unidentified death of a man digging a well when it collapsed on two workers. I am trying hard to establish that it was on William Cowle’s own land but the Board of Health minutes reported in the newspaper are very tight-lipped (so since he was Chairman I might be right!). Have just found your request for info. about local springs, there is one in the field below us at bottom of Gastrells which my paternal grandmother’s family used 1880 onwards. For many years she retained the yoke with which her brothers fetched water back to Bowl Top cottage. 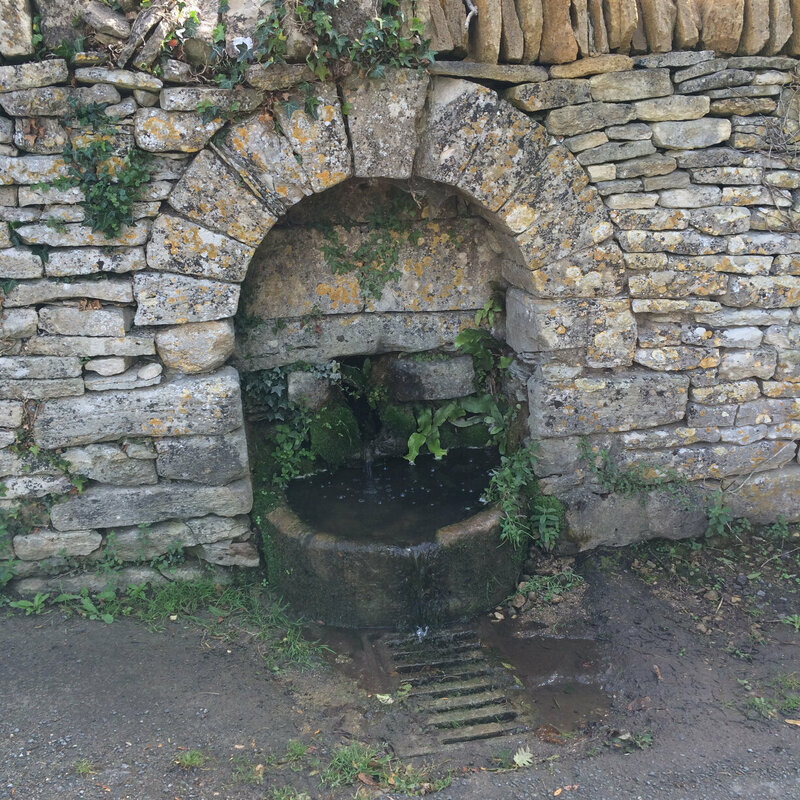 The Village Spring at Ruscombe has a nameplate just round the corner from the chapel on the left hand side. There is a lovely old photo of children fetching water in Victorian times using a yoke. 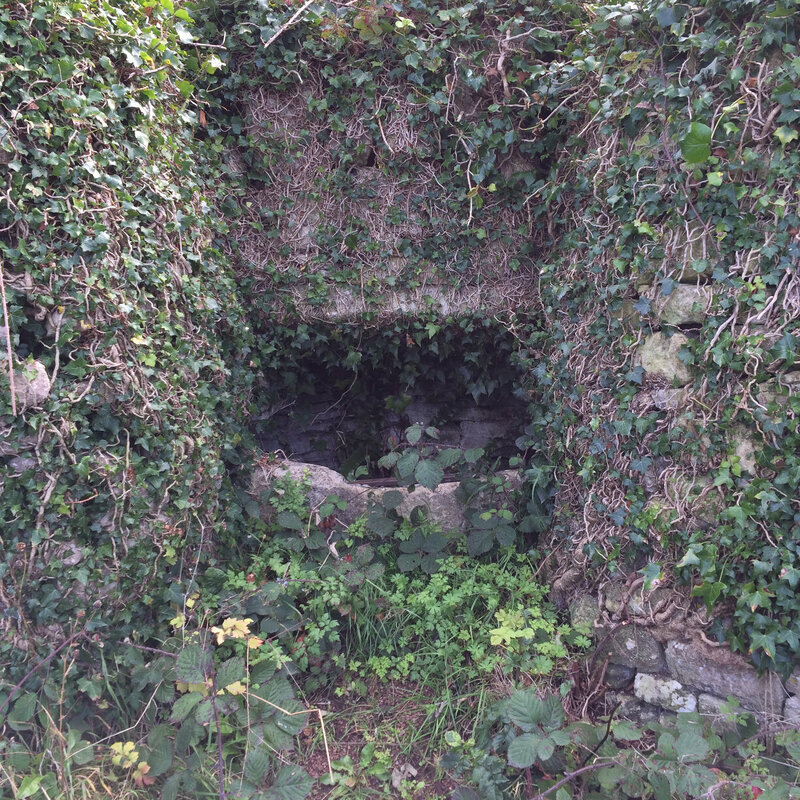 There is a spring in The Street at Kingscourt, rather overgrown now but it was used in 1940′s as was the one at Stanfields (now in someone’s garden I suspect). 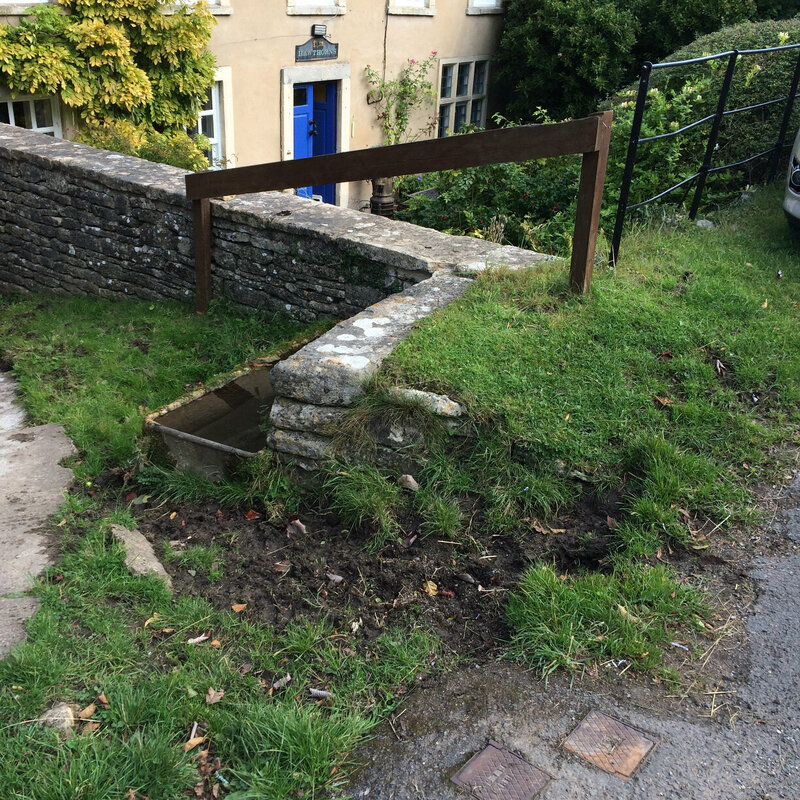 People still collect water from a spring in Selsley West near Middleyard. 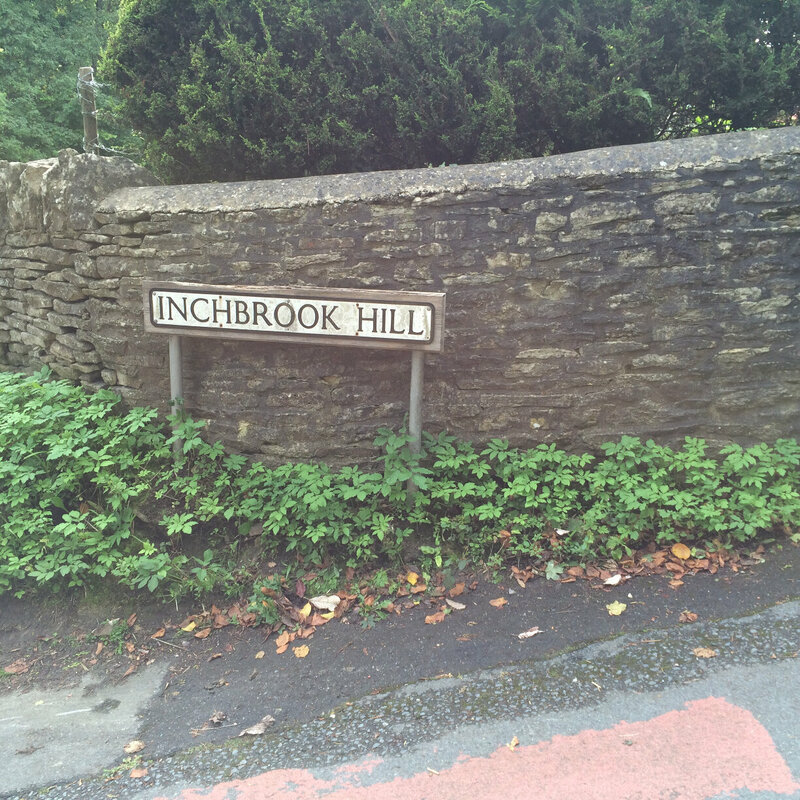 South Woodchester has one just up above The Ram. 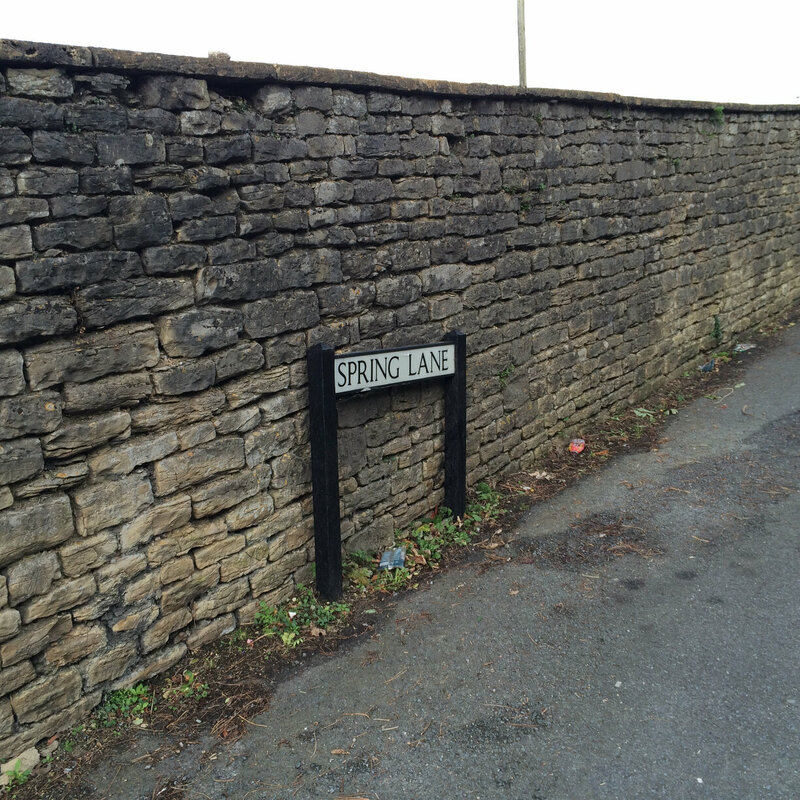 In Stroud, Spring Lane has Hemlock Well now barred up for obvious reasons. Parts of the High Street seem to be gently subsiding at the top end outside the Medieval Building! There are said to be lots of springs around the area of the Police station (- the (reservoir used to be just there) & the water is said to wash down underneath the road. In the 1980s when we were working on the Med Building, the road actually fell into a huge cavern! Iceland had planned to have an underground car park, but it was said to be too expensive & difficult to build because of the water. 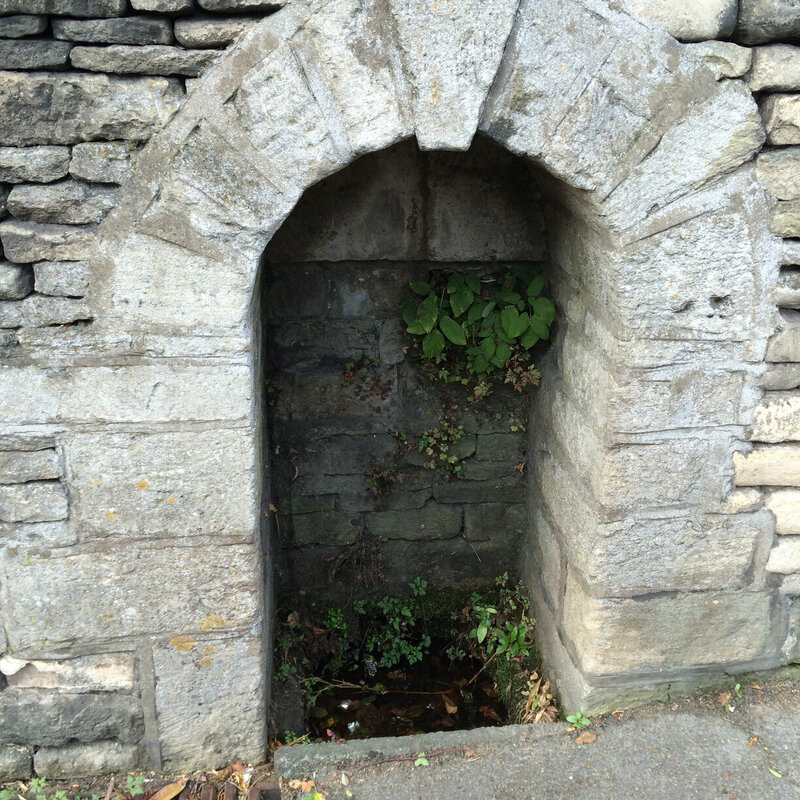 The All Saints Road spring used to feed wells at the back of the terrace of three houses built in 1860. The west house of the three does not have a cellar and we think that it would have flooded too much. 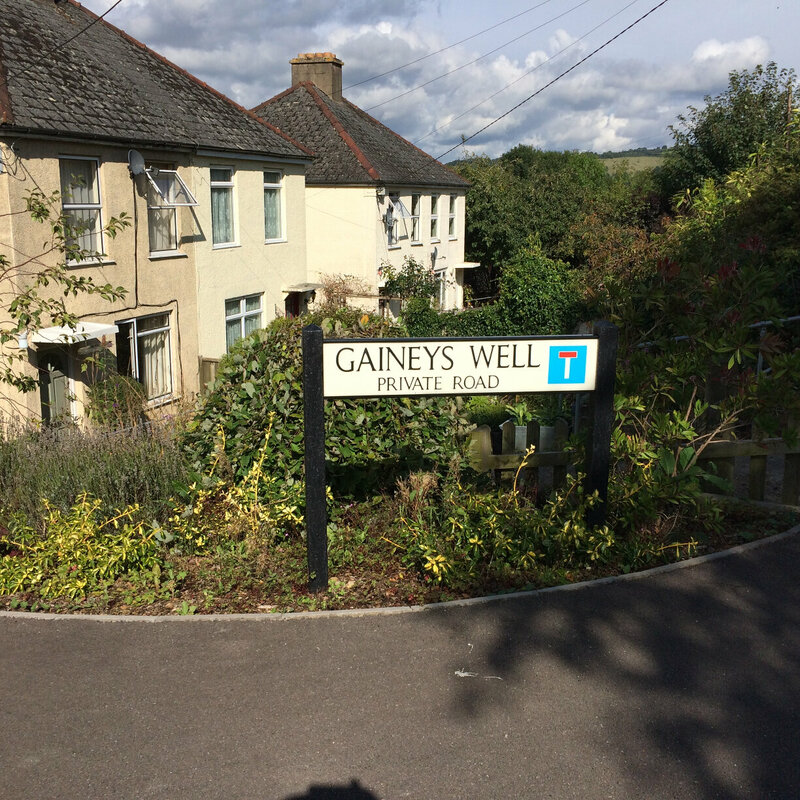 The spring is now conduited under the communal footpath which runs down the west side of the terrace and then under All Saints Road where you can hear it flowing all seasons by the drain at the corner of All Saints Road and Springfield Road and again just outside Uplands post office. The spring never dries not even in the deep freeze two winters ago. 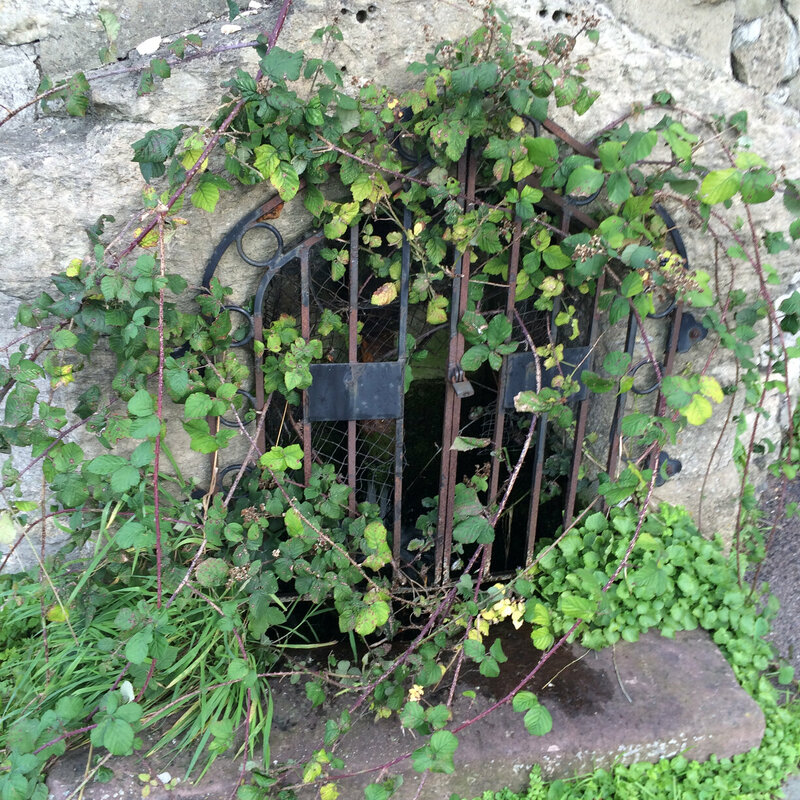 There may be other springs feeding that drain from higher up in All Saints Road – I am not sure. There is a second run of water into the bank of All Saints Road which moves occasionally – the bottom two houses cellars flooded badly in July 2007 never having been wet before and recent work on Thompson Road, parallel to All Saints road, moved those springs again and again the basements flooded. The older people are the ones to talk to as they have such long memories of water movement in the roads and it is a very sensitive issue. For instance the building opposite the Uplands Post office had a well in its grounds. When the cottage was redeveloped and upgraded that well had concrete put into it. 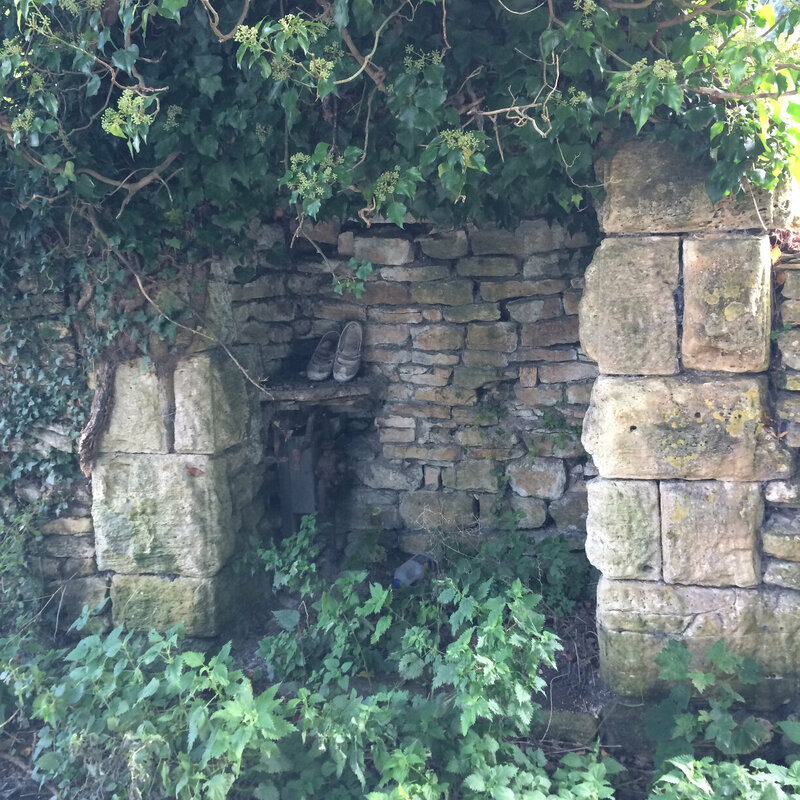 The water then worked its way down the hillside affecting other buildings and seeped out into the walls of Slad Mills, just where the Mill touches Slad Road, necessitating a lot of extra financial repairs. You will never finish this project – there are so many thousands of spring stories – fabulous and well done for doing this. I think it’s really important for people to know where the water runs under their houses! Steve – Leaky the Plumber – lives in Chandos Road – can always hear the sound of running water when he is awake at night. We had lunch yesterday with neighbours who are involved in our FEWC research and live at one of the cottages that originally belonged to The Field mansion – probably 17thC certainly 18thC. The Field was the name of the house (yes it is a real nuisance) originally built possibly as early as the 1300s but certainly there in 1560 when it was bought, along with its mill and hillside, from John Huckvale by Richard Arundell. The house itself had a face lift in the 1800s but some of the original outbuildings are still visible, and the two adjoining cottages are fully functioning. 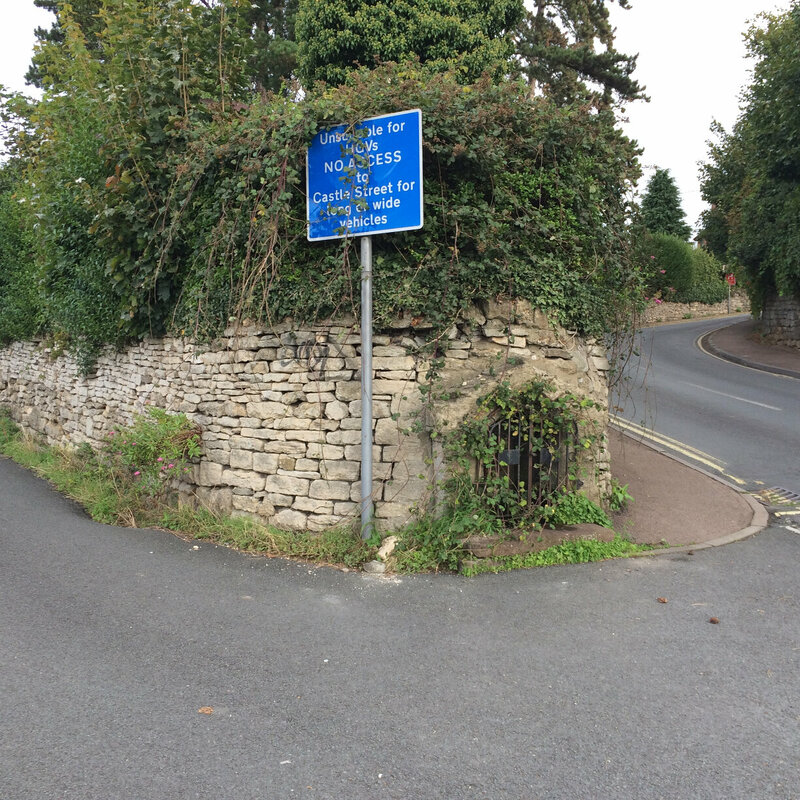 They did tell the tale of a spring-supplied house up at the top of The Heavens that only recently went on mains water, and Hemlock Well is of course just at the town end of Bowbridge Lane, but surely there must have been a water supply nearer than that? No rush – just another little jigsaw piece.